Tried it out - really works! Thanks! The ACU say my ctrl and crashed. I tried getting ver. 9.0 and upload that instead. Please give it a try, it should work better. But perhaps an update would do the trick? I'll try that first, and post the result. if you are using a non-HP server then look at this post to find out how to install the HP packages on it. HP ESXi Utilities Offline Bundle is not available for ML 150 G6, but your trick works perfectly. I have the HP ESXi 5.0.
lpfcdfc is a driver for Emulex adapters. The hpacucli tool works for HP SmartArray controllers only. Do you also have a SmartArray controller in the box? Then you can ignore this warning and should be able to use the tool with it. It seems I have some problem here. Any idea why cannot detect controller. I tried same method with newest version 9.20.9.0 but i get that ACU is already running. But controller is not detected. Maybe ESXi BUILD version is mandatory. 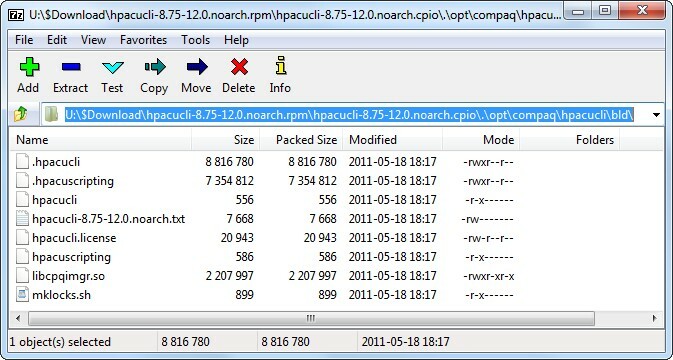 The error message "Another instance of ACU is already running" is usually caused by left-over lock files that the hpacucli shell script creates to prevent concurrent usage of multiple instances. Look inside the script to find out where these lock files are created and remove them before calling it again. Has anyone been successfull to get the HP ACU GUI working on the ESXi 5.1? Thanks a lot for the usefull script. Still using this for our smaller customers that have ESX4 / 4.1i and no shared storage. I gonna run fix4esxi.sh but I receive "permission denied". would you please give me your comment?! You missed the first . in ". ./fix4esxi.sh"
Is there a command to force o rebuild a raid in this CLI?? drwxr-xr-x 1 root root 1540 Mar 21 11:18 .
drwxr-xr-t 1 root root 1680 Mar 21 11:18 ..
What should I do here? Thanks a lot. my instructions are for ESXi, but you are using classic ESX. Please refer to http://www.bradcoe.com/wordpress/?p=120 to get this working on ESX 4.0. How I can change the path ?? have you moved the files to another directory after running fix4esxi.sh? You can change the path by editing the file hpacucli (change line #7) with vi in an ESXi shell. Thinking it could be a Smart Array firmware / HPACUCLI conflict issue of some sort as this machine is patched to the latest HP firmware levels and ESXi 4.0 has no HP CIM providers / no VMWare updates of any kind. BTW: Ive also tried this process with this System fully patched and with the latest HP CIM - same results. Full discoslure - i am NOT any kind of a Linux guru.. Using hpacucli 8.75 - While i am able to get into the cli, enumerating any array configuration results in the error message below + a CLI crash and an ssh session hang. Again - this is a clean install - the HPACUCLI had never been run before. Please don't waste your time with troubleshooting ESXi 4.0! I tested this only with ESXi 4.1, but you should really upgrade to ESXi 5.x which does no longer require the workaround, I would recommend using ESXi 5.1 for now, because 5.5 still has poor support from HP. FYI, the hpacucli script did not properly handle datastore paths with spaces in them. I got path errors in line 9 and 13. The workaround was simple of course I just cd'd into the volume by its UID path instead of using the symlink as this changed the results of 'pwd' to showing a path without spaces and it worked. So if anyone is getting that error it could be because they cd'd into the symlinked volume name and it contains spaces. I think this could be easily fixed by adding some quotes around the path variable in hpacucli but its working for me this way so I'm happy. Expanding an array as I speak. Thanks! This worked great on HP DL360 G7 running ESXi 4.1!! Thanks! This worked great on HP DL380 G7 running ESXi 4.1!! Thanks! I'm glad that you found this useful, but now it's really time to upgrade ESXi, right?! Awesome stuff, picked up a new client still running 4.1 and this saved me! Thanks! St google led me to this post and I couldn't be more grateful to you for taking the time to write it. It worked smoothly for me and allowed me to get out of a very compromised situation. Many thanks! I managed to install it on HP ML110 G6 server with Smart Array P212 Controller and now it detects that one of my drive is failed in my second array. Thanks!! 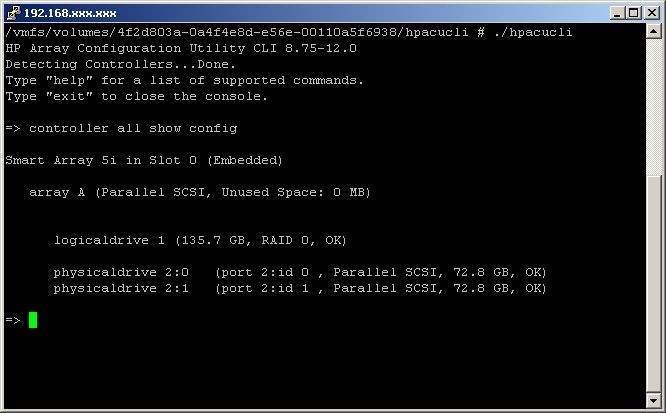 Just FYI if this helps anyone, on ESXi 6.0 I was able to install hpssacli which seems to replace hpacucli. esxcli software vib install -d "http://vibsdepot.hpe.com/hpq/latest/"
I rehosted the script here https://vibsdepot.v-front.de/tools/fix4esxi.sh. Thank you all very much for sharing.. folks like me that built things a long time back and haven't had time to go back to upgrade really appreciate your help! Really, thank you!